Via NetGalley, I received a copy of this book from HCI Books for the purposes of reading and reviewing it. Although it was provided to me at no cost, I am under no obligation to provide a positive review. As a martial arts instructor to children and youths, bullying is very much on the forefront of my areas of interest. Not just how to protect yourself from and handle bullies in a non-violent manner, but also how to prevent our youngsters from becoming bullies in the first place. This book is an outstanding collection of prose and poetry written by teens. 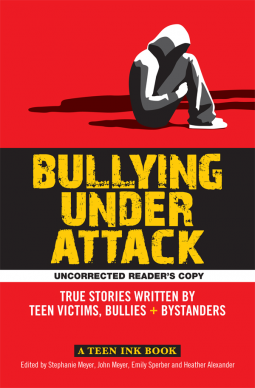 As the cover states, the stories are told by victims, former bullies and even bystanders. Not all of them are happy endings, but all of them are a message a hope. The victims may not have reached of point of power where the bullying is non-existent or doesn’t bother them anymore, but sometimes a glimpse of hope is all it takes. I was also pleased to see a couple stories from bystanders who readily admit they did nothing to stop a bullying situation. But by acknowledging it, they are putting themselves on notice to not let it happen again, which is still a positive step. The editors have included an extensive collection of books, websites, organizations and resources to help. Can’t put enough weight on how those resources might be able to help someone someday. This entry was tagged Bullying, Non-Fiction, Review Request, Young Adult. Bookmark the permalink. Wow! I’m so glad that you appreciated the book, and I’m honored that my motto resonated with you.